Blackbeard's is a great dive value. 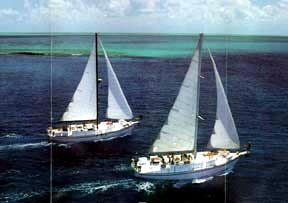 Six days aboard a 65 foot sloop, skimming the waves, soaking in the sun, lying on the deck, viewing the stars, and enjoying 3 or 4 great dives for 5 of the days. Blackbeard's does not have a set itinerary. They follow the calmest seas, hiding from the weather. In my 8 trips aboard Blackbeard's, I've experienced more than 40 different sites. 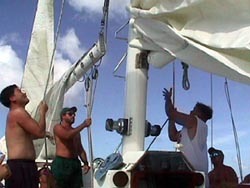 When not diving, you might be steering the vessel, putting up the sails, watching videos or enjoying sumptuous meals. I've enjoyed the Hesperus 3 times. Each time there are numerous barracuda circling the wreck during the day, and 4 or 5 huge loggerheads in the grass near the totally wrecked wreck at night. 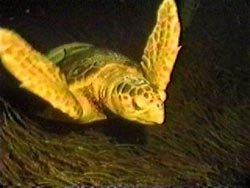 I've seen Theo's wreck near Port Lucaya and a hammerhead in the Cay Sal Banks. On all my trips, we dove with Bull, Reef and Nurse Sharks at Bull Run, the Arena. Blackbeard's takes you to wrecks, patch reefs, and walls, offering extremely diverse diving. The crew places your gear on your back before each dive and removes it after ascending the ladder. It's your job to set up and take care of your own equipment, stowed under the seats on deck. Every week also includes at least one night on shore, usually Bimini or Port Lucaya. I've also been to Paradise Island. Of course there has to be a catch when you get all this for such a low price. There are a few, if you're used to luxury, but these only add to the experience, if you're a real camper. The bunks are comfortable, but very small. My wife calls them shelves. In the couples cabin, two bunks to the left and two to the right, with the head straight on from the ladder, 8 people sharing one head with the living space of one normal room. Don't bring much clothing. The head involves a lot of pumping. Your arm will be strong by the end of the week. You really get to know the other people aboard in these close quarters. If this sounds like griping, remember, I kept coming back 8 times. It's just a warning to more finicky divers. It's not luxury. 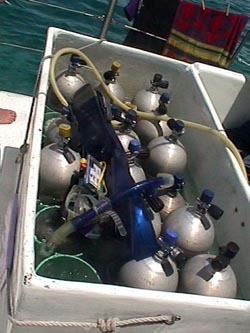 It's just a great time, great diving, great food and a wonderful, if cramped, experience.